A LARGE SILVER KIDDUSH GOBLET. Germany, 1929. On round base with tapered upper portion. 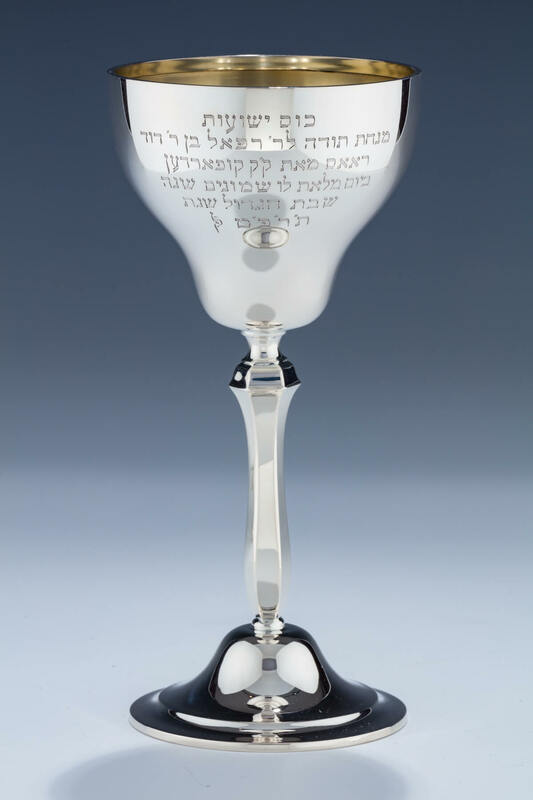 Engraved in Hebrew: “CUP OF SALVATION, A GIFT OF THANKS TO RABBI RAFAEL SON OF RABBI DAVID REISS FROM THE HOLY CONGREGATION OF KUPPERDAN ON HIS 80TH BIRTHDAY, ON THE GREAT SABBATH 1929”. Marked 800, crown and moon. 7.2” tall.